Lakshyam is a highly entertaining mishmash of romance, comedy, action, politics and family drama. It succeeds largely because of the casting – Jagapathi Babu, Gopichand and Anushka in particular do a fine job – and some skilful writing and direction that balance all the elements. The film opens with a girl running away from her own wedding. She looks so pretty and pristine as she scoots off across town, eventually making a rendezvous with a bloody and battered man. I was intrigued by the look of happy pride on her face when he efficiently blew up a car, shot a policeman and then hopped on the back of her moped. I wondered how they got to this point, and what was going to happen next. With a bit of time travel, we get to the chronological start of the story. The film is very well constructed, and the flashback and current day sequences flow well. There are some pleasingly playful references to filmi clichés and the cast seem to enjoy the improbable shenanigans. Anushka is Indu, a modern uppity type of college girl. She has a very specific list of demands for a prospective husband and seems to think it is perfectly reasonable to share this with a young child on the train. Pinky immediately decides to set Indu up with her uncle, Chandu. He has his own, very different, list of required qualities and even the kid knows it’s not likely to work. Anushka is one of my favourite current day actresses (yes, actress not ‘heroine’), and she is quite good in this role. Her character has some silly and selfish moments, but underneath it she is a likeable young woman. At the very least she knows when to apologise for her mistakes, so she is not too bratty. Indu is a Telugu heroine so of course if anything goes wrong she is reliant on any and every man within 20 metres of her for help and a solution. But the helpless female act is balanced with Indu cheekily pretending to be a gangleader’s sister and using his name to get her own way. This leads her into conflict with the cool dude on campus, Chandu. So she calls her little train friend’s uncle to sort him out. Yes – Chandu again. So there is a romantic comedy of errors as Chandu takes on Chandu and tries to bluff his way through. The silliness is increased with Brahmi and Venu Madhav battling each other for control of the student canteen. My reason for picking this film a while ago was that I hadn’t seen Gopichand in a lead role and I was curious. He does well and seems to be a good generalist in terms of Hero Skills. He can act a bit, dance a bit, fight a bit, and has an engaging onscreen presence. His introduction scene is vintage hero stuff – he is chained and dangling upside down in a police lockup. But with a single bound he frees himself and escapes to wreak havoc. The college romance scenes don’t work quite so well as the later more energetic action sequences but he and Anushka do have chemistry and he gets right into hamming it up. And let me applaud a song with a backup dancing Spiderman.There is not enough of it around. Chandu and Indu eventually fall in love and actually tell each other so they then just have to deal with all the usual obstacles – telling his family, her disapproving dad, and of course a crazed psychopath who happens to be a mad inventor. Chandu also gets caught in the fallout of his brother’s activities. He is a man of action, and takes a direct approach to solving problems. Although I did like that he sometimes cowed his opponent just with a graphic description of what he would do, so had no need of the actual biffo. You can have your cake and eat it too – a non-violent solution that incorporates a violent fantasy sequence. Gopichand is well able to match the changing tone of the film from the fluffy romance to the revenge driven action and drama. Chandu’s brother is Inspector Bose – Jagapathi Babu. He is an honest, crusading policeman and of course is wildly unpopular with the underworld. 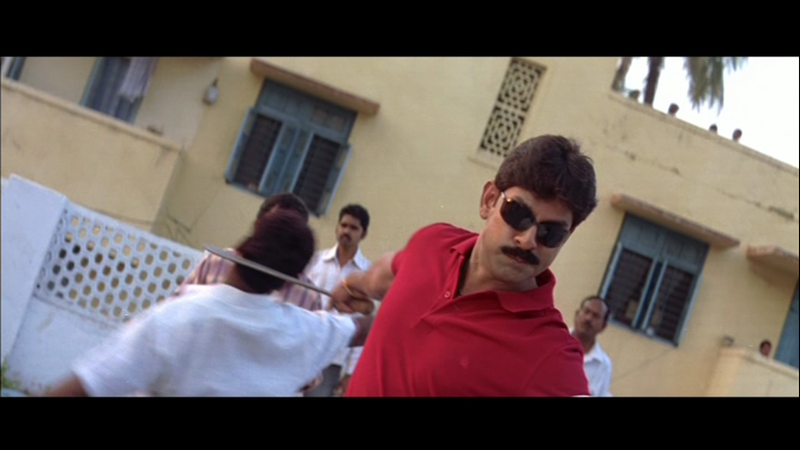 Newly transferred to Hyderabad, Bose takes on Section Shankar, Indu’s ‘brother’, a thug protected by senior police. I like Jagapathi Babu and this role is a good fit for him. Bose is a cop but also a family man and has a competitive relationship with his brother and his journalist father (Kota Srinivasa Rao) so there is lots of scope for his offbeat style. The brothers have different approaches but are not forced into a separation or battle for whose philosophy should win, and I really liked seeing that more natural sibling rivalry. They were great mates as well as brothers, and the family scenes were fun. Bose and his wife (Kalyani) have a very affectionate relationship, and it is a nice domestic environment. But Bose also has a kickarse side and Jagapathi Babu gets his own action sequences, including some excellent use of coconuts as both defense and offense. He is also the victim of one of the most elaborate assassination attempts I can recall seeing. I was muttering “What? He’s not dead – yet? What!” as the drama kept unfurling. It’s interesting that once again the law is shown as helpless in the face of crime and they rely on people like Chandu to get things done. Dharmavarapu Subramanyam is cast as an honest cop, and his comedic skills are used to help the story as a bumbling but good guy. Even Ashish Vidyarthi as the DIG makes it clear that the police need to rely on subterfuge to even compete let alone succeed, so there is an oddly defeatist note to the brother’s battle with Section Shankar and his corrupt cop associate (Devaraj). I was moderately alarmed when I read the long list of ‘comedy uncles’ in the cast, but Srivas and writers Gopimohan and M Rathnam do an excellent job of balancing the story elements and allowing a lot of the humour to emerge in a more natural style. Kota Srinivasa Rao is in good form as the newsman father who believes he might possibly be in charge of his household. Venu Madhav and Brahmi have a running battle which keeps them from bogging down the rest of the story, and when they do interact with the rest of the characters it is usually fun. And there are some amusing touches – a fixer for Section Shankar has gunfire as his ringtone, one rowdy knocks himself out in a fight, and there are lots of little reactions and one-liners that liven things up. The song picturisations are nothing out of the ordinary and neither is Mani Sharma’s music, but they are executed and placed well. Anushka is not much of a dancer although she does give her dance performances some energy and excellent facial expressions. I would say Gopichand’s natural genre might be ‘uncle dance’ and he does it pretty well. He certainly looked like he had fun dancing, and it added another degree of contrast to his vengeful brother aspect. And he seemed quite unperturbed by some of the shirts bestowed upon him. Lakshyam does strain the credibility muscles more than a few times, but it is such an entertaining and well paced effort that I just go with the flow. The cast are good and are given characters with a little bit more depth than I expected. There are convoluted schemes, a deathtrap, peculiar decision making – all the trappings of a good potboiler. The writing is clever and kept me smiling if not laughing out loud. And the baddies got their various comeuppances in suitable style. It was all quite satisfying. Give it a go! 3 ½ stars. This entry was posted in Tollywood and tagged Anushka, Anushka Shetty, Brahmi!, Devaraj, Dharmavarapu Subrahmanyam, Gopichand, Gopimohan, Jagapathi Babu, Kalyani, Kota Srinivasa Rao, Lakshyam, M Rathnam, Mani Sharma, Srivas, Telugu, Tollywood, Venu Madhav. Bookmark the permalink. I have watched the Hindi dubbed version of this movie which was rather poor in terms of dubbing quality and took away much of the entertainment value of the movie. After reading your post, I am now looking forward to watching the movie in its original language Telugu with subtitles whenever possible. Thanks for the good review Temple!